Here is a web site to help with your handyman projects including step by step videos. Ask Dad the Handyman launched today. TBH Creative was hired by Ask Dad the Handyman LLC to develop a functional web site. 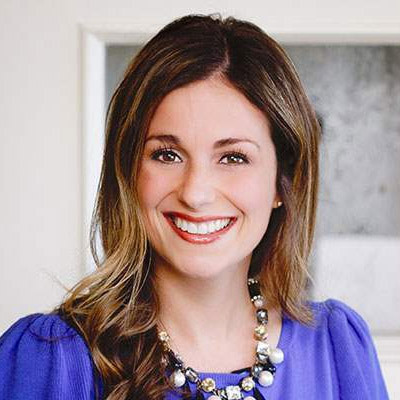 They envisioned a web site that offered complete handyman project solutions (with videos) to customers. They wanted the ability to add new solutions themselves including uploading videos for each step of the project. End-users would purchase the solutions they needed for a small fee and be provided with in-depth, step-by-step instructions for the associated project. 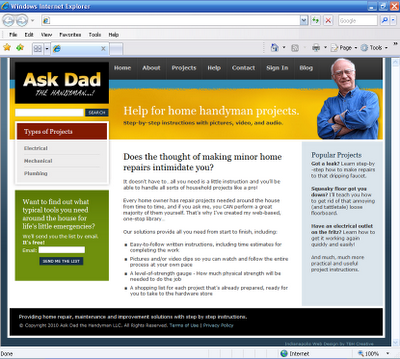 Ask Dad the Handyman hired another web company prior to TBH Creative who could not complete the desired functionality and left them hanging. TBH stepped in and completed the project with all desired components and offered recommendations to make the system even better. TBH Creative also redesigned the look of the web site offering a strong and bold presence and easy to use navigation system. Ask Dad the Handyman offers solutions for typical projects around the house such as replacing a lamp socket, fixing a dripping faucet, or replacing a failed Ground Fault Circuit Interrupter (GFCI). Don (the handyman and owner of "Ask Dad") is an expert "Mr. Fix-it". His solutions are complete, in-depth, and come from experience. If you are looking to do a few things yourself at home, Ask Dad the Handyman is the place to search for answers. You can handle all sorts of household projects with his web-based library of handyman solutions. 9/1/2010 - Unfortunately, this site was turned off today and no longer available online. TBH Creative is a full service web design company located in Indianapolis, Indiana. We help many clients like "Dad" who have previously hired web developers that cannot deliver. We will deliver and offer recommendations for your web site presence that will help your business. Check our web site and give us a call today.